A little inconvenient relative to shopping and food. 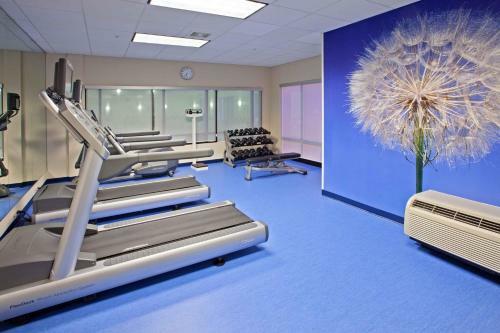 Great location, clean rooms, indoor pool, but could be bigger along with fitness room, nice breakfast buffet, nice staff and plenty of restaurants near. Would stay here again! Kitchen area with big fridge, complimentary great Breakfast-nice. No hot tub, small TV, no DVD player. I enjoyed my stay here. It was very comfortable. On my way back home, I plan to stop here again. I hope I have time to use the pool this time. 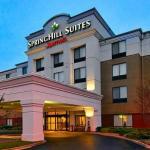 The 142 all-suites SpringHill Suites by Marriott Louisville Hurstbourne provides quality accommodation at an affordable price equally suited to the business traveler on families on vacation. Items included with the room rate at this four-story, non-smoking hotel are an expanded continental breakfast, high-speed Internet access, local telephone calls, a morning newspaper, parking and coffee available in the lobby 24/7. 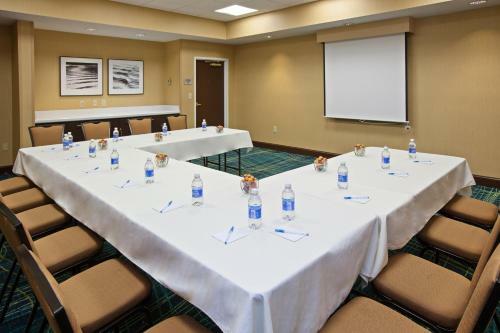 There are two meeting rooms available for business or social functions. The larger can accommodate 35 guests. Area landmarks and attractions include six golf courses, Waterfront Park, Louisville Slugger Museum, Louisville Glassworks, the Muhammad Ali Center, the Jim Bean Distillery and Churchill Downs, home of the Kentucky Derby. 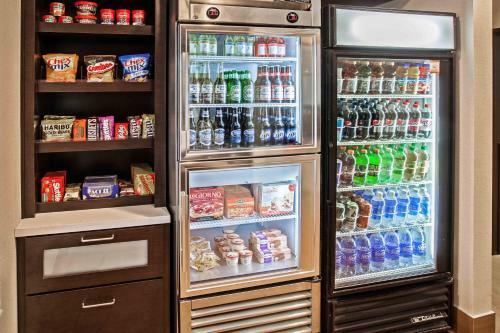 All the suites have a pantry area, wet bar, mini-refrigerator and microwave oven. Other features are a work desk with high-speed Internet access, Internet browser television with cable news and movie channels, pay-per-view movies, pullout sofa bed, alarm clock, tea and coffee making facilities, two-line telephone with voicemail and speakerphone, iron and ironing board and a hairdryer. This hotel has an indoor swimming pool, whirlpool and a fitness center. The complimentary breakfast is the only meal served here but there are several places to eat nearby including an Applebees, McAlister's Deli, the Martini Italian Bistro and the Limestone Grill. The 24-hour front desk has safe deposit boxes and a list of restaurants that will deliver to the hotel. 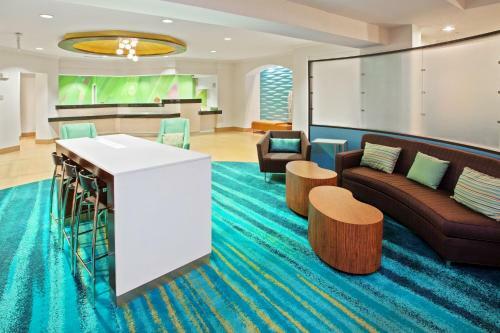 Other amenities include a concierge desk, full service business center, limousine service, daily housekeeping, a coin-operated laundry, valet dry-cleaning, vending machines, a picnic area with a barbecue grill and a gift shop and newsstand. Several clients who stayed at this SpringHill Suites said it was better than many similar hotels. There were proper coffee mugs and real glasses here, while they had Styrofoam and plastic glasses elsewhere. The breakfast room was more spacious and the employees worked hard to insure everyone had an enjoyable visit. Most guests appreciated the economical rates and said they would use this hotel on future visits to Louisville and would recommend this property to others.